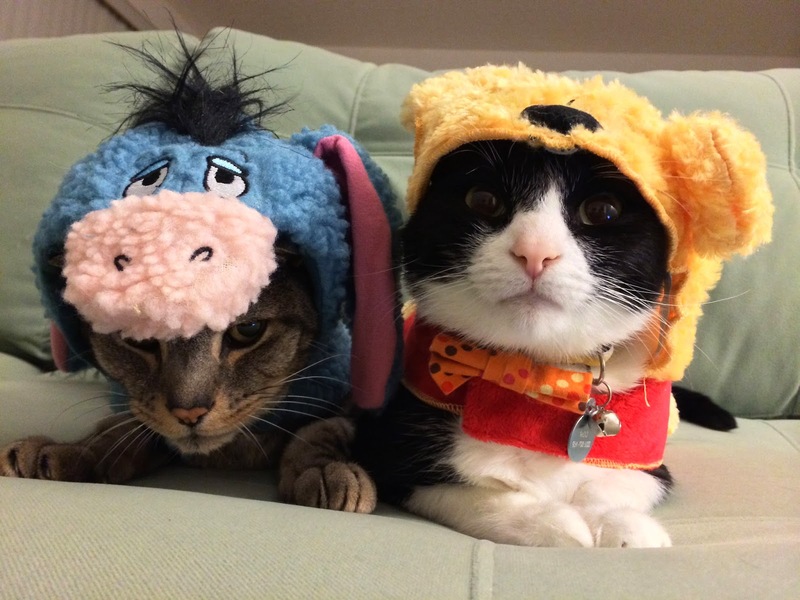 Your Daily Cute: Pimp and Moo's Halloween Costumes - Eeyore and Pooh! Pimp and Moo's Halloween Costumes - Eeyore and Pooh! Happy Halloween, Cuteheads! You know we couldn't possibly let this go by without the boys dressing up! 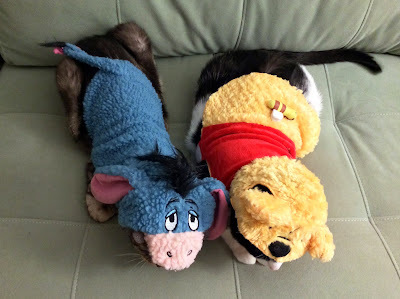 This year we take a little trip to the Hundred Acre Wood... and Pimp and Moo become Eeyore and Winnie the Pooh! On to the photo shoot! Aerial view! Are these not ridiculous?! Moo...really? Don't you know what you're wearing? Nobody ever understands what we have to put up with. I don't understand why I can't see anymore! I love these costumes! I think they might be my all-time favorites, and we've dressed up as a bunch of stuff! Thanks again to Petsmart for sending us them for free and making our Halloween the cutest ever! Hope everyone has a happy and safe Halloween! Keep your kitties indoors and give them treats! 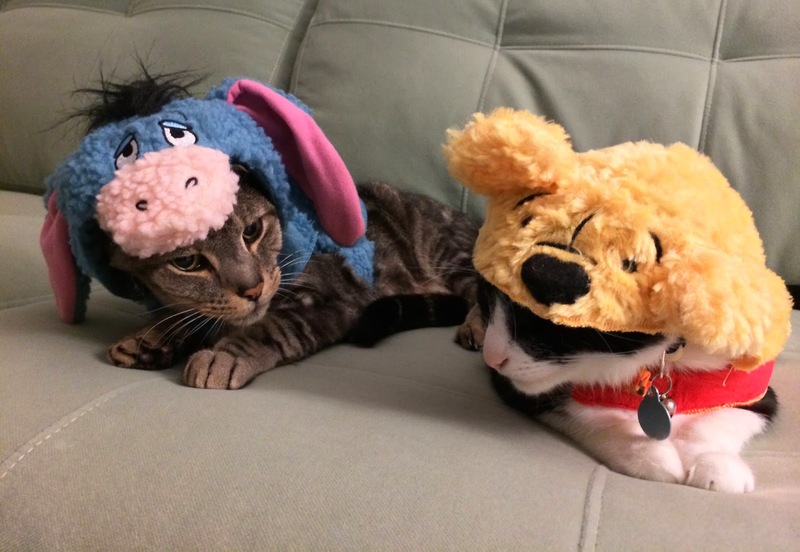 These costume and the looks alone warrant lots of treats! Temptations, anyone? So adorable and their sweet faces always. Still laughing after last night's preview! Moo is all like : aw hell no! I am not wearing this...Pimp is "long suffering" as always...Happy Hallween to all! O.M.G. Just when I thought that nothing could ever be cuter than all of the cuteness I see every day (my kitties, everyone else's kitties, Just. Kitties). Then THIS happens. 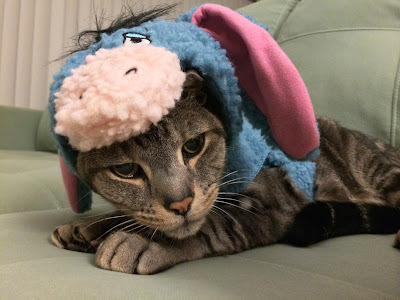 And of course, Eeyore was always my favorite, so to have Eeyore combined with my most beloved Pimp (sorry Moo you are quite quite an adorable Pooh) - well, it's JUST too much! Too Funny! ... not so scarey though, as their very friendly little faces are popping out under those crazy heads.They are so tolerant about the dressing up, I guess they are resigned to it now, and you probably bribe them with loads of treats! Happy Halloween. OMC they are too ADORABLE! Happy Halloween! OMG i LOVED THIS! Bahahaha thanks for the well needed morning laugh. Moo's face is too much. Clueless! LOVE! Aww! Love it!! We dressed Jeddah in Yoda ears, I posted it on her page, hilarious. She didn't like them too much but finally gave it. Yay for Pimp and Moo! thanks for reminding me. I forgot my husband used to keep the cats indoors to keep them safe from pranksters. I better go find Johnny. Penfold cried to come back in last night. He has slipped out on one of my exits or entries. I wondered how you could afford costumes for the cats! Thank you to Petsmart! that is so cute. i need a bucket. Hands down Moo and Pimp have the cutest costumes! They look great! And they deserve extra treats for dressing up! 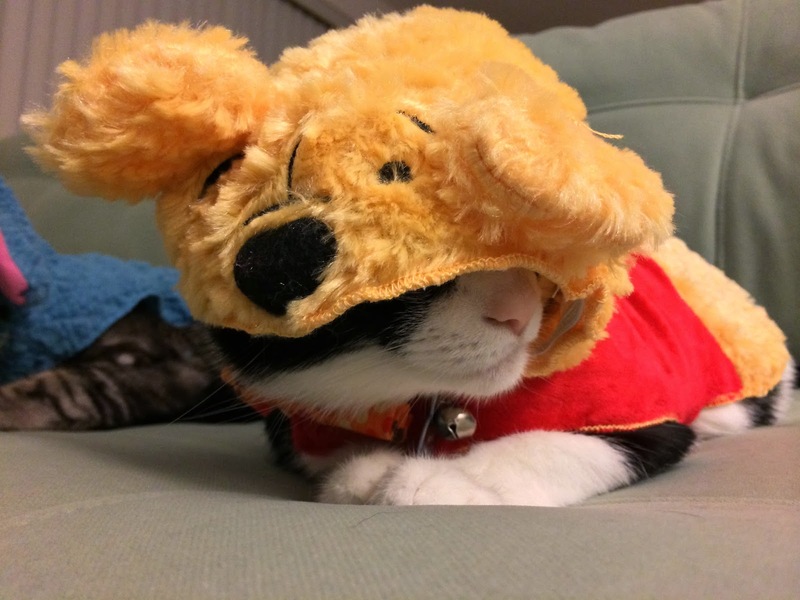 In the second pic, Moo is really rocking "The Pooh"!